It’s discount season with retailers and shoppers alike preparing for Black Friday. One of the most intense periods of the year according to the retail professionals that we talk to. “This is a really fun period because we are rolling out major promotion campaigns and our sales is booming. At the same time you have that nagging feeling that you might have over-promoted stuff. Or that you didn’t promote as much as you should have”, a category manager at a Swedish fashion retailer tells us. In this post we will shed some light on how retailers can improve their promotions mix during these shopping holidays. Promotion events in general, and Black Friday in particular, make customers shift their purchases over time – from periods with higher prices to periods when prices are low. By looking at the graph below you get a sense of this effect. As you can see, the promotion results in a huge sales lift. But after the lift comes a sales drop. What happens is that consumers buy a lot when its cheap, more than usual. And when the promotion and price go back to normal they consume less. This is generally called Stockpiling. Promotion-induced consumer stockpiling has a negative impact on promotion profitability since it moves back in time brand sales that would otherwise have occurred at full margin. Stockpiling is typically measured in %-points of the total promotion sales lift. E.g. a promotion with 23% stockpiling, implies that 23% of the sales lift from the promotion was actually stolen from future sales. For goods with long durability such as canned food, coffee, vitamins, beauty products this a particularly important phenomenon. What is important to notice is that the stockpiling effect can differ lot between brands within the same category. So this is something you can observe in many promotions. What about Black Friday? 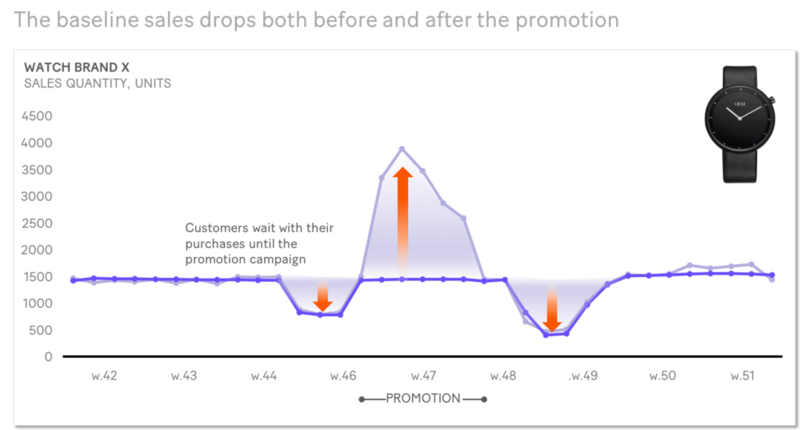 The promotion sales lift is now not only followed by a sales drop. You now also see a drop in sales before the promotion. Double trouble! In order to get the true lift, you need therefore not only take the drop after into account but also the drop before. Now, the presence of stockpiling doesn’t mean that all your promotion campaigns are unprofitable. Merely that some promotions could be significantly less profitable that what you think they are. There could however be other reasons for doing a promotion campaign, such as growing the overall consumer basked or driving site traffic. And, the positive impact from these effects must be balanced against any negative stockpiling effects. When you find a good way of assessing the overall impact from your promotion, then you really got something going!